Published by Caribbean Art 1992. Evil spirits bar the way: they fill the air or space. The spirit pointer in rhythmic breathing, guttural groaning, singing and changing as she performs her hexing dance at the four corners to remove them. 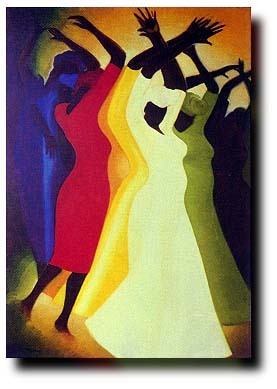 This work was used by Capitol Records as part of their "Art N’Soul, Capitol Records Embracing Black Music’89" campaign. It was a big winner of the CEBA Awards. An annual event initiated by the World Institute of Black Communications to pay tribute to communications excellence to Black audiences. It won the award for excellence in the poster, publicity and sales promotion category, as well as the sales promotion, point of purchase, packaging category. There are many tales to be told about the impact of this image as it travels the world (at another time).